ENERGY STAR® is a voluntary program created by the EPA that helps businesses and individuals reduce energy consumption to save money and protect the environment. Why choose ENERGY STAR® qualified windows and doors from All American Exteriors? Replacing old windows with ENERGY STAR® qualified windows can lower household energy bills by 7 to 15 percent, according to the U.S. Environmental Protection Agency (EPA). Lower energy consumption also reduces greenhouse gas emissions from power plants and shrinks a house's carbon footprint. With thousands of ENERGY STAR® qualified windows and doors, All American Exteriors can help improve the comfort and energy efficiency of your home while also providing style and long-lasting durability. Simply tell your All American Exteriors in-home sales consultant that you want ENERGY STAR qualified windows and doors. How do All American Exteriors windows and doors earn the ENERGY STAR® label? To earn the ENERGY STAR® label, windows and doors must meet rigorous energy performance levels. Qualified products must also have third-party certification based on testing in recognized laboratories. 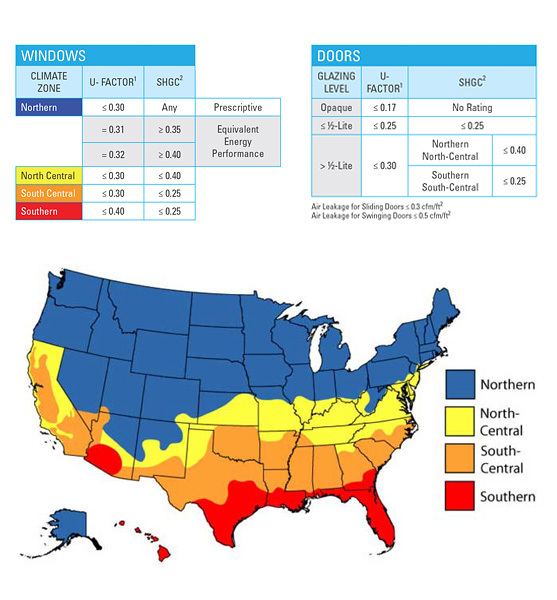 ENERGY STAR® divides the U.S. into four climate zones, each with its own unique set of energy performance requirements (shown above). Energy efficiency for windows and doors is compared by using two important measurements: U-Factor and Solar Heat Gain Coefficient (SHGC). In the northern zones, U-Factor and SHGC requirements focus on helping reduce the need for heating. In the southern zones, requirements generally aim to reduce the need for air conditioning. Special glass coatings help control how much of the sun's heat enters and how much of the controlled air temperature inside escapes. Because All American Exteriors offers a variety of glazing packages, including several high performance glass options, a professional All American Exteriors in-home sales consultant can configure windows best suited for our climate zone.